Christmas is right around the corner! It’s time to dust-off your baking sheets and crank-up your ovens. This recipe is slightly adapted from one offered by my local grocer. It’s pretty easy to do – the hardest part might be separating the egg yolks from the egg whites. 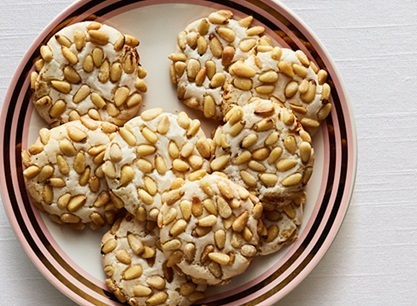 In any case, if you like the taste of almonds and pine nuts, I think you’ll like this recipe. Can’t tolerate pine nuts? Use slivered almonds instead! Preheat oven to 300°F. Line two baking sheets with parchment paper; set aside. Separate eggs. Place whites in a separate bowl. Save yolks for another use by placing yolks in a container. Add 1 Tbsp. cold water over the yolks; cover tightly and refrigerate yolks for no more than 3 days. Use yolks as an egg wash, in an omelet, in Armenian Chicken-Lemon Soup! Place almond paste in the bowl of a stand mixer fitted with a paddle attachment; beat on medium speed until softened (about 1 minute). Add half of the egg whites and beat on medium speed until smooth (about 1 more minute). Reduce speed to low and gradually add in sugar while beating constantly. Scrap the sides of the bowl with a rubber spatula, as needed, until sugar is fully incorporated and mixture is smooth (about 2 minutes). Add remaining egg whites and beat until batter has thickened. Spoon batter by the heaping tablespoonful onto two prepared baking sheets, placing spoonfuls about 1 inch apart. Sprinkle each with 1 teaspoon pine nuts, lightly pressing them in place. Bake 18–20 minutes or until cookies are puffed and lightly golden. About halfway through baking, switch cookie sheets from top to bottom rack. Allow cookies to cool completely before carefully removing them from parchment paper. 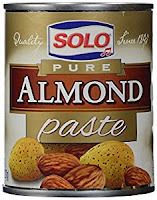 ** Almond paste can generally be found in the baking aisle of most supermarkets. Gosh you people are really God-sent. As the weather is these days, all it calls for a ginormous cup coffee and cookies and as always i am looking for new cookies to try and thanks for sharing this easy and simple recipe. Next time i am sure my kitchen will be brewing the smell of these cookies. Thank you. Are there Armenian pine nuts available in the US? Most pine nuts I find in supermarkets are from China. Also, will marzipan work in this receipe? The only types of pine nuts I've ever seen in US markets come (mostly) from China, and Italy. I've found Italian pine nuts, which I prefer, in my local Publix supermarket. Marzipan vs almond paste; there is a difference. Marzipan is a sweet, pliable mixture of almond paste, sugar - or honey - and sometimes unbeaten egg whites. It's firmer than almond paste and is used in making candies/chocolates or as fondant for cakes. 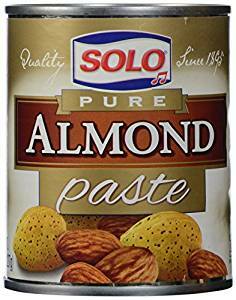 Almond paste is a mixture of blanched, ground almonds, sugar, glycerine (a colorless, odorless, syrupy mixture which helps prevent sugar crystallization in food or candy)) - or other liquid, and sometimes almond extract to intensify the flavor. It's less sweet and a bit more coarse than marzipan and is used in baked goods. To answer your question, I'd stick to the almond paste for the recipe!